These are a snapshot of some of the projects we have delivered over the years. ech2o are one of the lead consultants for West Sussex County Council’s Engauge project. The Engauge programme is designed to provide schools with an overview of their current sustainability performance using a bespoke method called Susgauge. Enguage is about measuring the performance of the school, providing costed solutions for environmental improvements and engaging with the pupils to make them more aware of the issues around climate change, water, waste and biodiversity. In 2008 ech2o carried out comprehensive water audits on 12 primary and secondary schools. The audit detailed water use throughout the school, and included an understanding of the current water culture amongst staff and pupils. The audit was backed up by a report that rated each school against DFES benchmark tables and included a comprehensive spreadsheet highlighting potential water, CO2 and monetary savings from implementing various low-cost and zero-cost water efficiency measures. ech2o is pleased to be the lead environmental consultants for Hackney City Farm, one of just 10 community organisations across the UK involved in the final of the Big Green Challenge, which (with a £1 million prize fund) encourages the development and implementation of new approaches that will lead towards a 60% reduction in the community carbon footprint. Hackney City Farm relied on our expertise to identify the best way to achieve their “60 steps to 60%”, an initiative which emphasises that small steps eventually achieve a large target and that everyone has a part to play in reducing carbon emissions. ech2o carried out a comprehensive carbon audit of the farm and its café, including CO2 emissions from energy and water use on the farm and in the café, CO2 equivalent emissions from the animals and from food waste, and the carbon footprint of travel to the farm from visitors, workers and volunteers. We identified what the farm needed to do to meet the 60% reduction target (both from a technological and a behavioural aspect) and presented this in headline figures, backed up by a series of in-depth reports. It is vital to understand where and how any building produces CO2emissions. From October 2008 to September 2009, we monitored the farm’s energy, water and gas consumption using a combination of smart meters, sub-meters and monthly manual meter reads to best understand how the farm’s use of energy and water changes across the year. We also designed a simple spreadsheet programme that enables visitors to measure the carbon footprint of their household and to equate that against the UK average. ech2o’s involvement in this project enabled the farm and its visitors to move from simply being informed about carbon reduction to actually taking action to reduce their emissions. Hackney City Farm has already implemented the suggested behavioural changes and is now fundraising to be able to implement the technological solutions we have identified.ech2o will continue to work with the farm throughout 2010 to monitor how successful it is at reducing its CO2 footprint. In 2009 ech2o partnered with Thames Water and Aqualogic as part of Thames Water’s Schools Water Makeover which consisted of an audit, retrofit and education programme for 22 primary and 10 secondary schools in the Thames Water area. The project aims were to produce a measurable reduction in water consumption whilst engaging and educating the school’s pupils about the need for water conservation, and to generate case studies that can be used to encourage other schools to use water wisely. 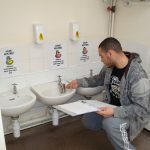 The project’s findings have helped Thames Water to better understand water use, and potential water savings, in schools. The schools were logged to measure current water use and this, combined with historical bills data, was used to rate each school against DFES benchmark tables. After an assembly about the project by ech2o, and an audit of the school by a group of pupils, Aqualogic technicians visited the school to undertake a professional audit and to fit various water-saving technologies including urinal controls, dual-flush mechanisms and percussion taps. By logging the schools throughout the process the effect of both behavioural changes and different technical solutions were identified and quantified. ech2o water experts ran various water awareness workshops and delivered 33 “Be Water Aware” assemblies to 7,446 pupils and 264 teachers, explaining why it is important to save water and the link between water and CO2 emissions. We urged pupils to be more water aware and challenged them to save at least 10 litres of water a day.ech2o worked with 557 pupils in 21 of the schools to carry out a water audit and to identify low-cost and zero-cost water efficiency measures that could be implemented to reduce their water consumption, as well as encouraging pupils to contribute other ideas toward reducing their school’s water footprint. We acted as environmental consultants on two short films and demonstrated how to fit a save-a-flush bag to 2539 pupils in 31 schools. In twelve of the schools ech2o worked with the pupils to collect data about their use of water at home and to identify behavioural changes to reduce their family’s water footprint. Each pupil involved in this part of the project received a home pack which included a shower timer, a save-a-flush bag (to reduce WC flushing volumes by 1 litre), a measuring tool (to record flow rates from taps and showers), stickers about saving water, and a questionnaire (to fill out at home) which details behavioural use of water. By working with families in this way, valuable data is collected, the wider community becomes involved, and analysis of the data enablesech2o to draw conclusions about behaviour around water in homes. Analysis of the data was shared with the participating schools. The educational part of the Water Makeover links into key stages 1, 2, 3 and 4 across maths, science geography and citizenship. ech2o worked with pupils from ages 5 to 18, and at the end of the project had achieved a more sustainable water culture amongst the staff, pupils and their families in the participating schools. This greater water-awareness and the corresponding step change in behaviour around the use of water both at school and at home, has the potential to save as much as 27,000m3of water a year.